I’ve recently found out that onions are generally a bad idea for me. If I don’t want to end up having certain health issues that I won’t discuss here, I need to generally avoid them like the plague. To say the least, this has really put a cramp in my cooking-style. Almost every recipe out there involves onions of some description or another. Sliced, diced, chopped, minced, pureed… somehow, it’s present in everything from soups and stews to burgers and meatloaf. What’s an onion-avoiding girl to do?? 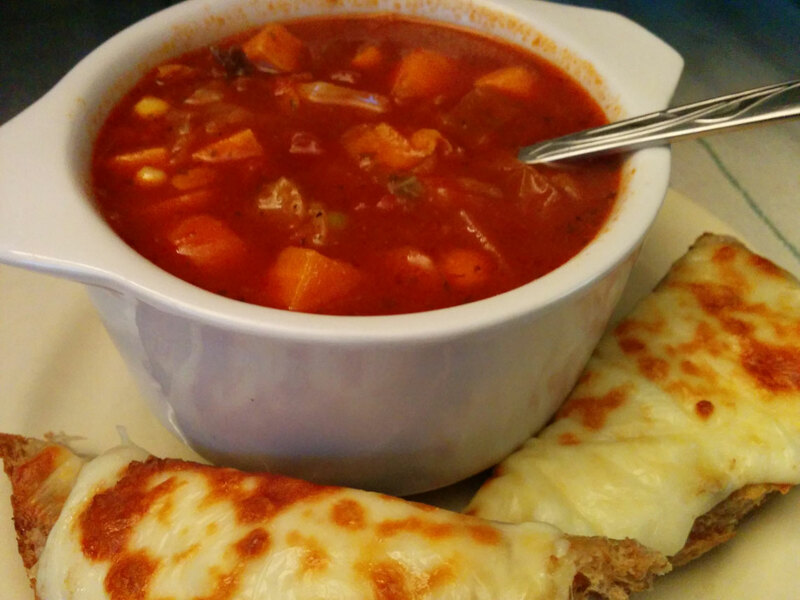 With the recent rainstorms and cooler summer weather, I’ve found myself craving a good, hearty, warming soup. 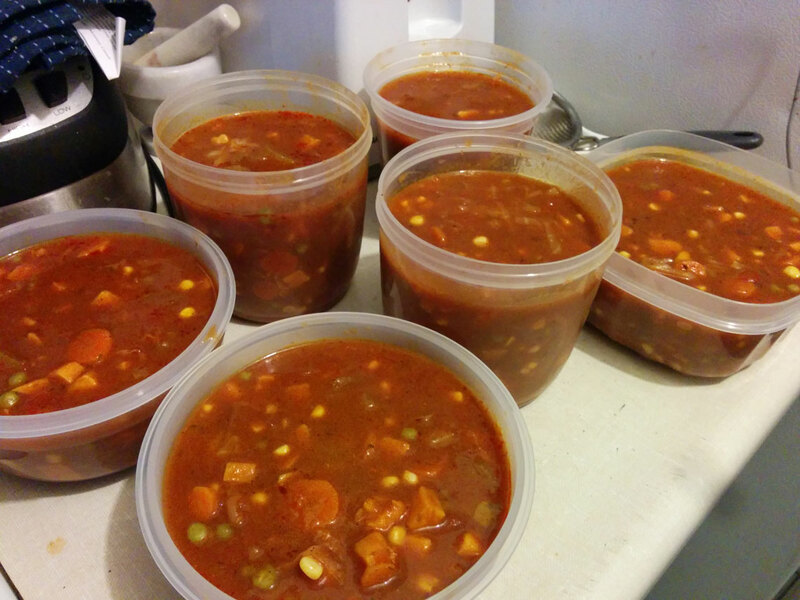 Yes, soup in the summer — I’m not crazy, I promise! But again: soup = onions. Right? Well, not exactly. I’ve found that I have no adverse effects from onion powder. There’s hope yet! Based on this and wanting to get something equally tasty and nutritious into me, I went out to buy some veggies I haven’t had in recent days: cabbage and sweet potatoes. Sure, I’ve got potatoes in my pantry but the sweet potatoes are generally so much better for you and they just have a different taste. So, today, after I had gotten up from a short afternoon nap, I started chopping and slicing and whipped up this yummy little number. I’ve dubbed it Summer Solstice Warming Vegetable Soup because I created it on the Summer Solstice and the flavours are warming without being “spicy”. Feel free to play with the seasonings to make it more to your taste, but I have to say that this turned out better than I originally imaged! In a large stewing pot over a medium heat, melt the margarine with the oil. Once the margarine is melted, add the carrots and celery and sautee until they begin to soften (all from List One). Add the flour and the Seasonings List. Stir to mix well and cook for a minute or so. List Two: Deglaze with the alcohol (or some broth), then add the sweet potatoes and cabbage. Pour in the beef broth at this point and give everything a good stir. Add the tomatoes, mushrooms, beef stock pots, water, Worcestershire, steak sauce, canned tomatoes and tomato paste and stir everything to mix it well. Bring this to a low boil. Cover with a lid. Set the pot on a baking sheet (in case of spillage). Set into oven. Remove from the oven and add corn, peas (List Three) and the reserved cabbage (from List Two). Cover and put back in the oven for another 30 minutes. This entry was posted in comfort food, dinner, experiments, Lunch, one-pot-wonders, oven, recipe, sides, soups, stew, stove-top and tagged beef broth, black pepper, cabbage, canned tomatoes, carrots, celery, chili powder, cinnamon, corn, corn on the cob, cumin, extra virgin olive oil, flour, garlic powder, Jack Daniel's, knorr's homestyle beef stock, kosher salt, margarine, Mrs Dash, mrs. dash table blend, mushrooms, nutmeg, olive oil, onion powder, oregano, paprika, parsley, peas, pepper, reduced sodium beef broth, salt, soup, steak sauce, sweet potatoes, thyme, tomato paste, tomatoes, unsalted margarine, vegetables, worchestershire sauce. Bookmark the permalink.